The entire halogens family is very reactive. Fluorine is the most reactive of all the halogens, joining directly with each and every other element apart from oxygen and some of the noble gases. Thus, it is as well termed as a super halogen. We have as well observed that the reactivity reduces from F2 to I2. In displacement reactions we will examine that fluorine shifts all the remaining three halogens from their salts, chlorine shifts bromine and iodine, whereas bromine displaces just iodine. Halogens react with one other to form inter-halogen compounds. Halogens, in general, react by most metals; however bromine and iodine don't react by some noble metals such as Ag and Au. Halogens as well react by numerous non-metals to form halides. 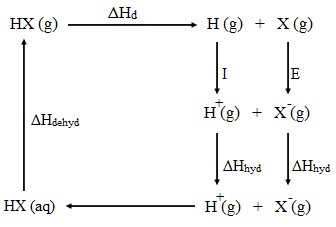 Halogens react by hydrogen to form hydrides which are termed as hydrogen halides. Fluorine and chlorine react by hydrogen with explosive violence; fluorine-hydrogen mixture explodes even in the dark. Chlorine-hydrogen mixture does so merely in the presence of light. This is termed as a photochemical reaction. It has been illustrated that this reaction begins by the formation of halogen free radicals. It is not surprising in view of lower X-X bond energy as compared to the H-H bond energy. Reactions of bromine and iodine with hydrogen are very slow, the latter being reversible. The above reactions are termed as Chain Reactions since after the initiation of the reaction, the propagation (Step 2) and (Step 3) are repeated in series till the reactants are consumed. The reaction gets terminated whenever free radicals begin combining with one other as in (Step 4). 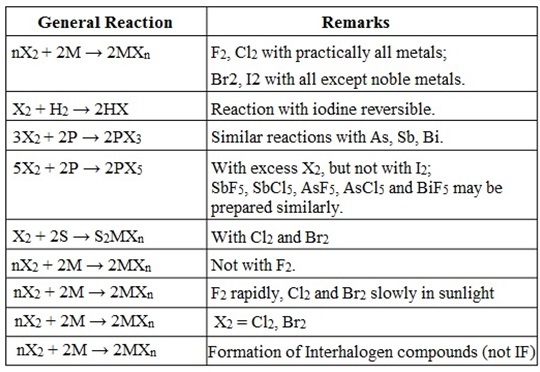 Some of the reactions of halogens are summarized in the table shown below. In general, the fundamental or metallic nature of elements increases as we go down a group. Therefore, last member of each of the Groups 14, 15 and 16, that is, Pb, Bi and Po, correspondingly, is definitely metallic in character. However, this trend is not so well marked in the elements of Group 17 as very little is known regarding the last member of the group, astatine. There is, though, definite proof to exhibit the existence of halogen cations in media which are weakly nucleophilic. Fluorine is the most electronegative element and consists of no fundamental properties. Chlorine exhibits a slight tendency to form cations. For illustration: ClF ionizes to form Cl+ and F¯ because of the higher electronegativity of fluorine. Bromine cation, Br+, exists in complexes like Br (pyridine)+ NO3, electrolysis of ICN in pyridine solution provides iodine at the cathode. This points out that ICN ionizes to I+ and CN-. Most of the pyridine complexes, example: [I (pyridine)]+ NO3, [I (pyridine)2]+ClO4 and I (pyridine)+ CH3COO are acknowledged. Under normal conditions HCl, HBr and HI are gases whereas HF is a liquid, because of strong hydrogen bonding. Their boiling points and melting exhibit a gradual increase in the order HCl < HBr < HI, however H-F doesn't follow the trend and has surprisingly higher values. This is due to the reason of strong hydrogen bonding in H-F molecules. The thermal stability of hydrogen halides reduces from HF to HI. Therefore hydrogen fluoride is the most stable while hydrogen iodide is the least stable. This can be examined from their percentage dissociation data (table shown above). For illustration, as HF and HCl are not appreciably dissociated even at 1473 K, HBr is dissociated to the extent of around 0.5% and HI is dissociated to the extent of around 33% at 373 K.
becomes more exothermic from HF to HI. As expected, acid strength differs in the reverse other, HI being the strongest acid and HF the weakest acid.